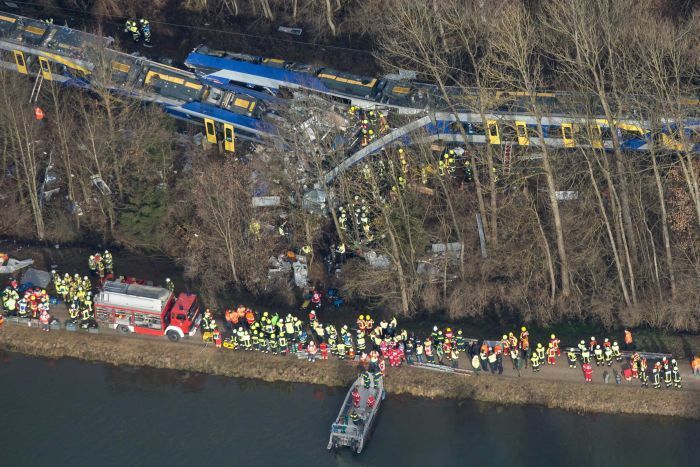 Investigations into a head-on train crash in Bavaria that killed 10 people are focused on the actions of a signal controller, sources close to the inquiry say. But officials said it was too early to speculate on the cause, but added they had recovered two of three black boxes from the passenger trains that collided at peak commuter time on Tuesday morning. “The investigations are focusing on the controller,” said a source, who declined to be named. The single-track stretch was opened for both trains, the source said. Citing sources close to the investigation, newspaper group RedaktionsNetzwerk Deutschland said a signal station worker had manually deactivated the automatic signalling system to let the first train — which was running late — go past. Influential daily newspaper Sueddeutsche Zeitung said preliminary investigations showed a signal controller had switched off the safety system and only realised the mistake when it was too late. A spokeswoman at state-run railway, Deutsche Bahn, which is responsible for the track, said the company was working with investigating authorities. “We do not want to pre-empt the results of the investigation,” she said. German Transport Minister Alexander Dobrindt, echoing statements from investigators, said it was too early to identify the cause. “We have no knowledge whether this was down to human failure or a technical problem,” he said. Mr Dobrindt told rolling news channel NTV that an automatic braking system fitted on the line underwent routine checks just a week ago and was found to be “fully functional”. Salvage workers and police were combing the site on Wednesday and working to recover the carriages that were lying on their side in the wooded area, with a river on one side of the track. The trains, carrying about 100 people in total, crashed at high speed on a six kilometre stretch of track between the spa town of Bad Aibling and Kolbermoor, near the Austrian border. All bodies had been recovered from the wreckage, police said, adding that 17 people were seriously injured and 63 slightly hurt in the collision. The automatic brake system was introduced across Germany after 10 people died near the eastern city of Magdeburg in 2011 when a train driver drove through two red signals.